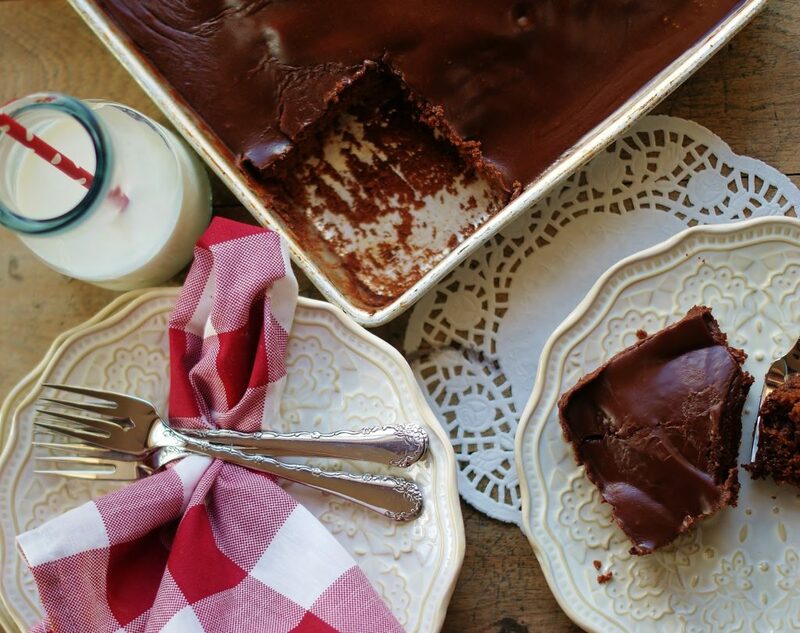 If you like chocolate, I mean really like chocolate, then this Buttermilk Chocolate Sheet Cake is your cake. It is not for the faint-hearted or the casual chocolate consumer. This cake is hide-in-your-closet-and-eat-by-yourself good. 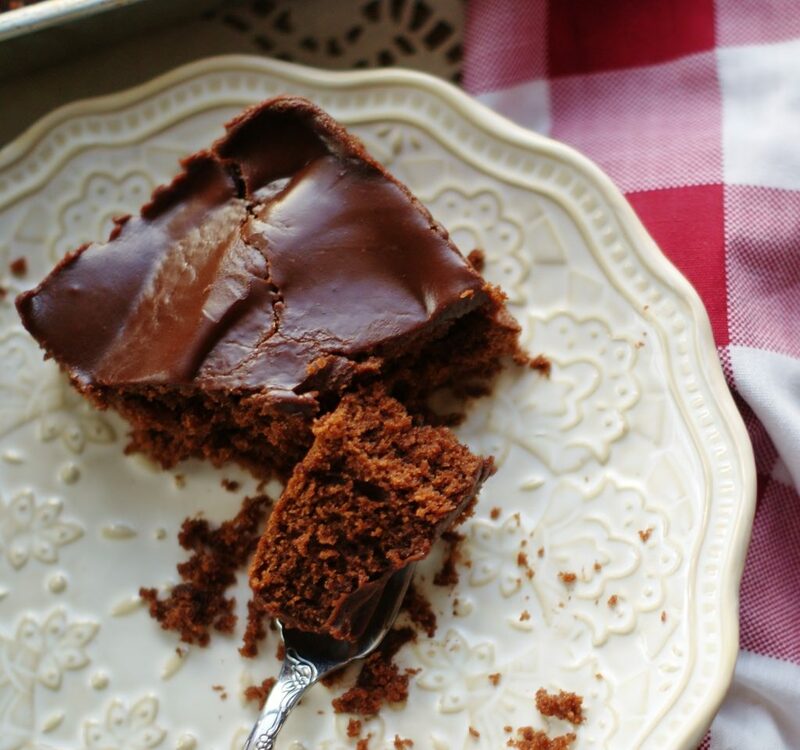 This Buttermilk Chocolate Sheet cake is one of those cakes when you take the first bite, you just have to close your eyes to revel in what simply might be the best thing you have ever decided to put in your mouth. Involuntary oohs and aahs could quite possibly escape from your lips. Sigh… Yes… it’s that good. Normally, I am not a huge fan of sheet cakes. I really like layered cakes for a number of reasons that have nothing to do with anything but my own quirks. However, The Engineer, being from Texas and always claiming things being far superior there, loves Texas Sheath cake. So this sent me on a hunt, a hunt for a recipe that I could call my own. 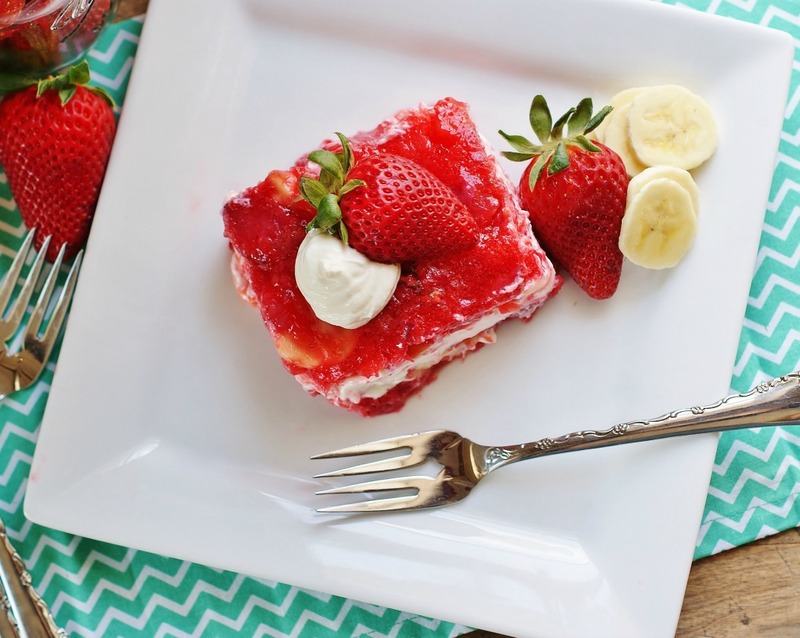 The cake is usually made in a large jelly roll pan or baking sheet, and while it is quite large, it is only about 1 inch thick. It is rumored that Lady Bird Johnson had a hand in creating and/or naming this cake, but that claim can’t be substantiated any more than Texas’ claim to it being a “Texas cake.” Who knows where this cake came from or where it got its name (You can read more about its history here. It’s really quite interesting.). All we really know is that it is good cake, really, really good cake. 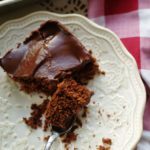 The Chocolate Buttermilk Sheet Cake recipe below is the result of a long and arduous search for the perfect “Texas” sheet cake– that heavenly mixture of single layer melt in your mouth cake that does not dry out, covered in rich chocolate-y fabulousness. Be forewarned though. There is nothing about this that says “diet.” It’s gorgeous, rich cake, for crying out loud, not spinach salad. So after much research and taste testing (It’s a tough job, but somebody’s got to do it), here is a velvety, rich cake that would hold a solid place of respectability at any gathering in Texas… or anywhere around the South… or simply in your closet while you eat alone. I won’t tell. This post contains affiliate links. I earn a small commission (at no cost to you) if any purchases are made when you click through those links, even if what you purchase isn’t the ASD pick. That commission is an essential part of what keeps A Southern Discourse up and running. Thank you so much for being a part of ASD! 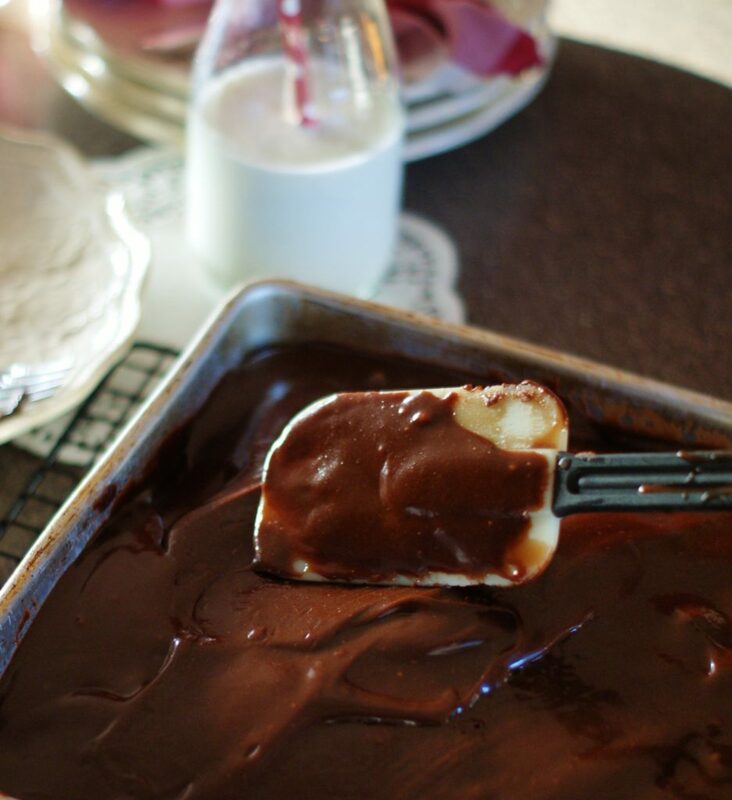 Note: I use a lightly greased 18 x 13 cake pan to make this cake instead of a jelly roll pan. This Nordic Ware pan is perfect because it has a lid. 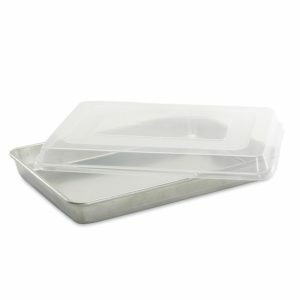 I don’t know what I would do without the lid! It comes in so handy when I take this cake to family or church gatherings. Not to mention, with this pan, my cakes always cook evenly and never stick. I love it! 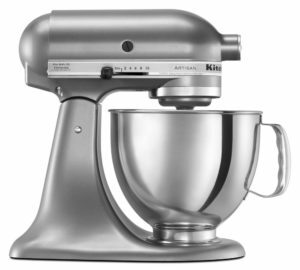 In a mixing bowl, combine flour, sugar, and salt. Set aside. In a saucepan, melt butter over low heat. Add cocoa and stir. Add hot water (I heat it in the microwave). 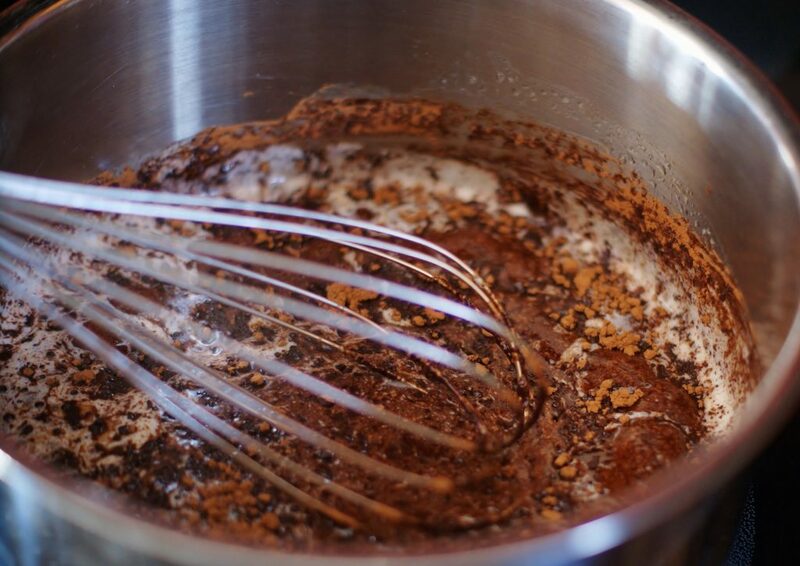 Allow butter, cocoa, and water to boil in saucepan for 30 seconds. Pour over flour mixture in mixing bowl, and mix lightly to cool. 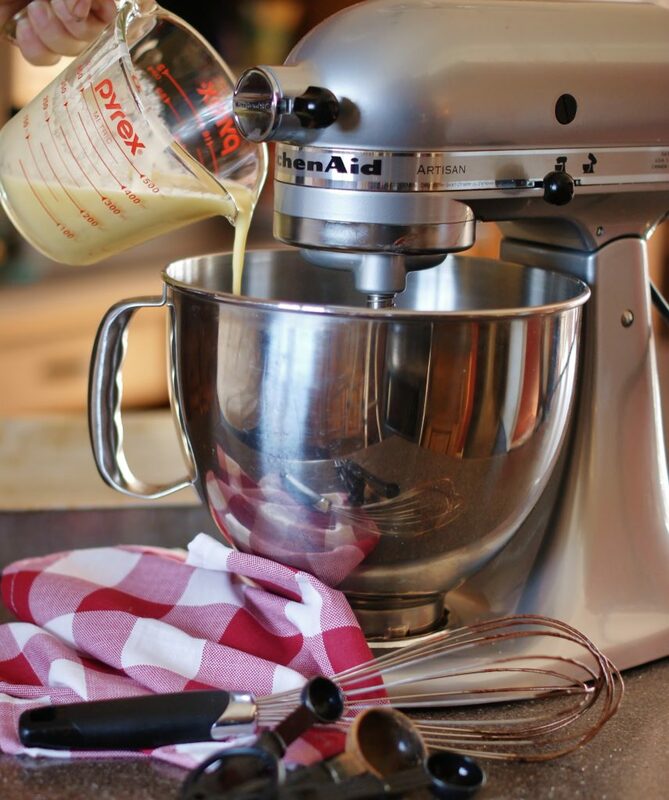 In a large measuring cup, measure the buttermilk, add beaten eggs, baking soda, and vanilla. Stir. 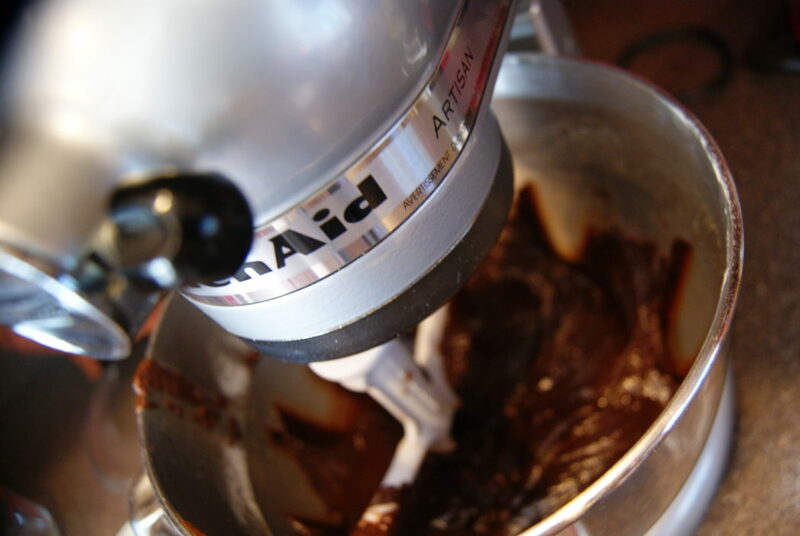 Gently mix buttermilk mixture into butter/chocolate mixture. Melt butter in clean saucepan over low heat. Add cocoa and stir to combine. Then remove from heat. 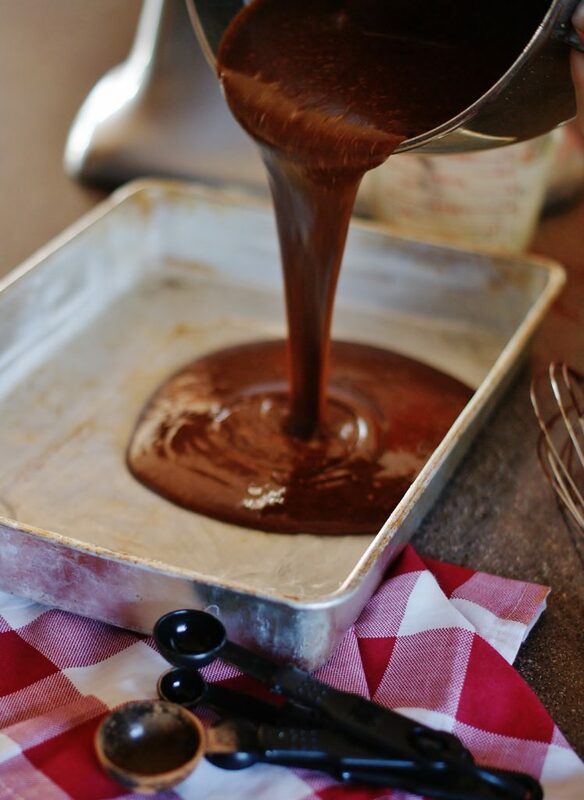 Pour over warm cake. Spread with a spatula if necessary. 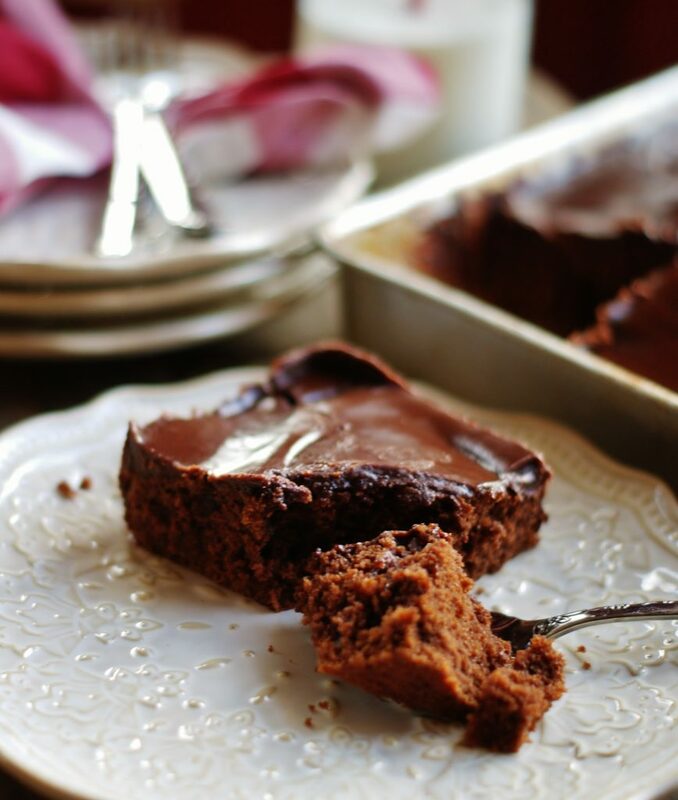 You can serve this while the cake is still warm and gooey, and it is sooo good. Ice cream is pretty much a must. Bonus! After the cake has completely cooled in the fridge, the icing sets up like fudge. 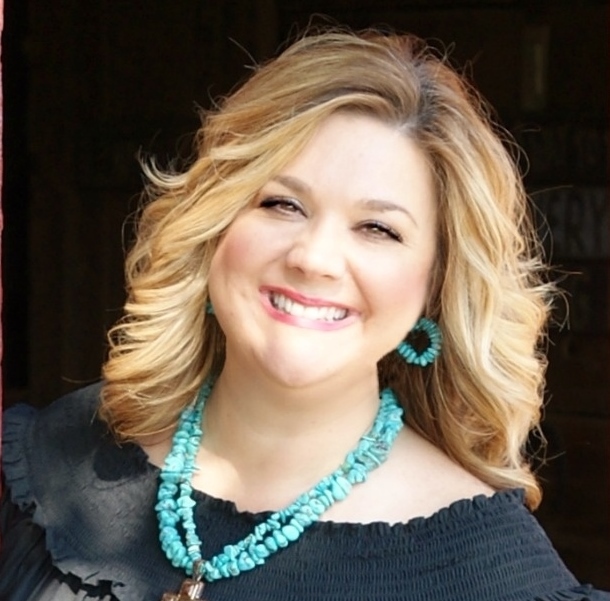 Check out this and a ton of other great Southern recipes at Foodie Friday! Want more cake? 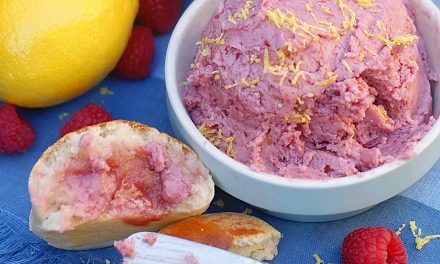 Try these ASD favorites! 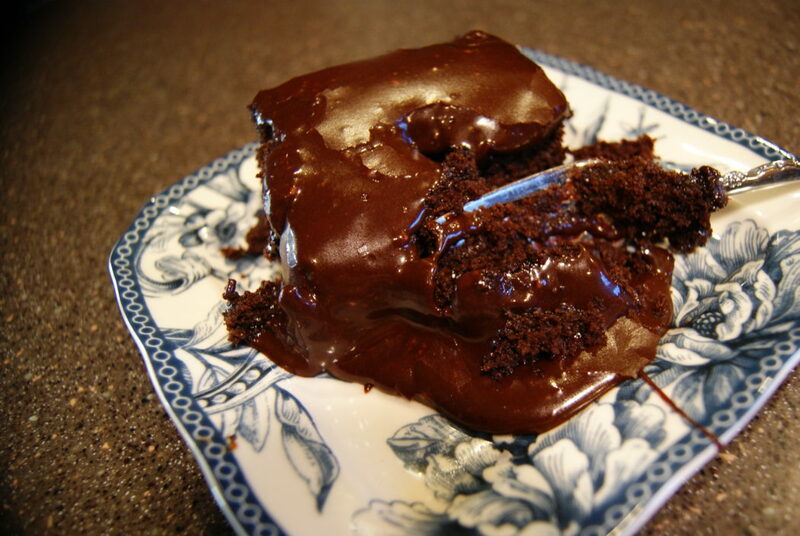 A single layer of melt in your mouth cake that does not dry out, covered in a rich chocolate-y fudge. Preheat oven to 350 degrees Farenheit, and lightly grease an 18 x 13 cake pan. Add hot water. 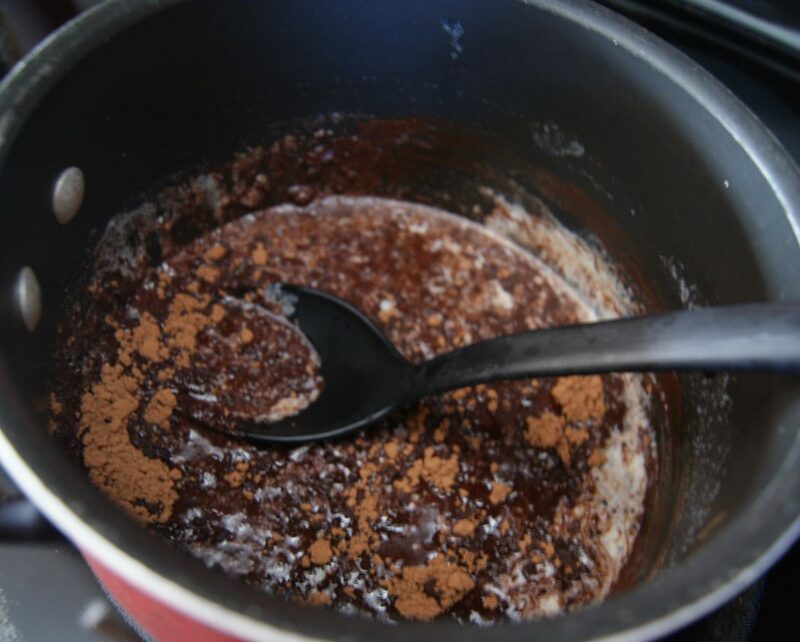 Allow butter, cocoa, and water to boil in saucepan for 30 seconds. 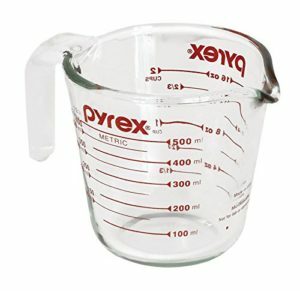 In a large measuring cup, measure the buttermilk; stir in beaten eggs, baking soda, and vanilla. 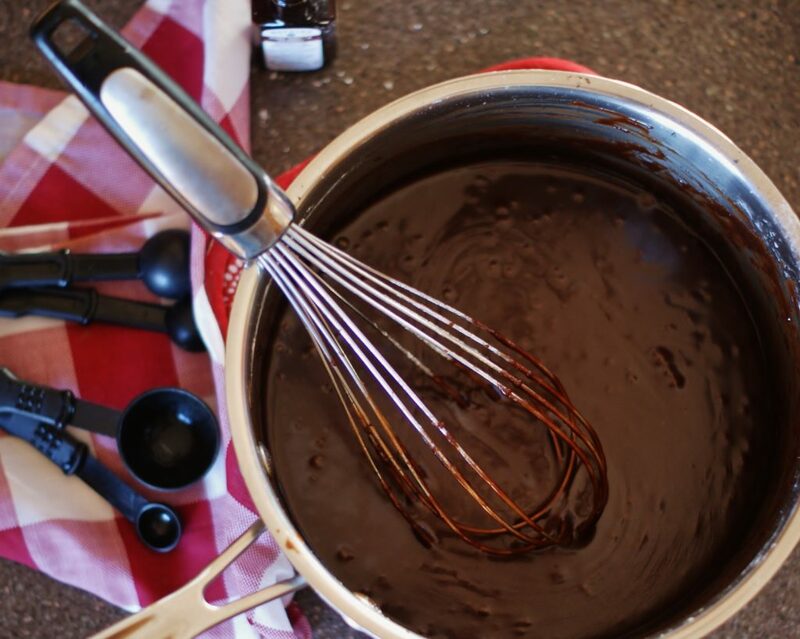 Gently mix liquids into butter/chocolate mixture. Melt butter in saucepan over low heat. Add cocoa and stir to combine. Then remove from heat. Add the milk, vanilla, powdered sugar, and cinnamon. 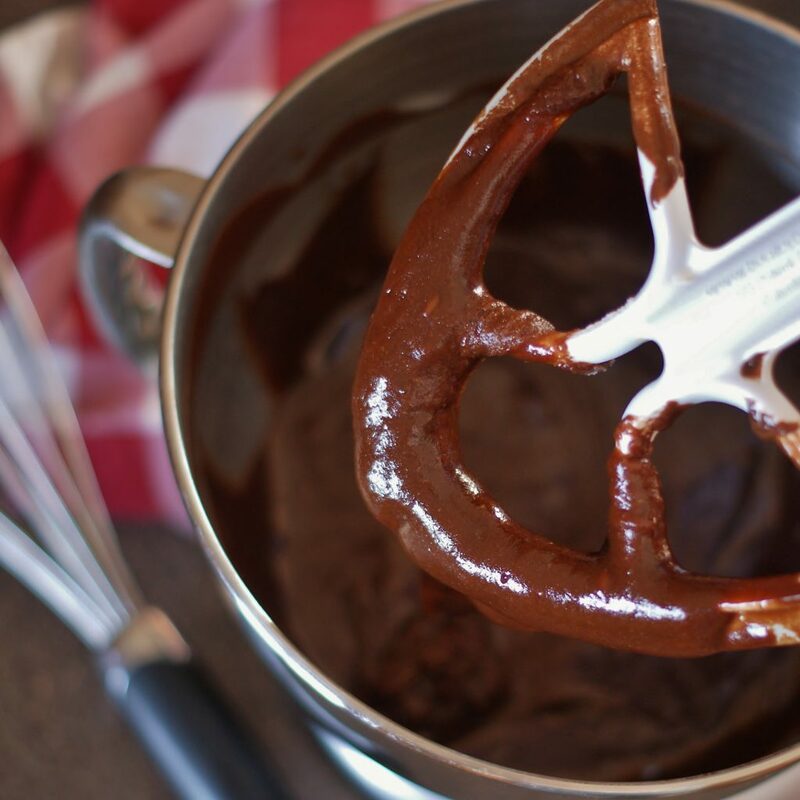 Whisk together until shiny and smooth. After the cake has completely cooled in the fridge, the icing sets up like fudge. This recipe was originally published October, 2014. Anna! Ha! I always need taste testers! I hope you make this cake, and it lives up to your all of your great memories. Maybe it will bring back that birthday tradition. I make something similar but before pouring on the icing, I poke holes all over the top. The icing then fills the holes. Oh! YUM! This would make a great poke cake! What a great idea! I am going to try that next time. Why oh why am I not eating refined sugar? Oh no! I don’t want to to tempt you to cheat… but the holidays are coming up soon… It’s always good to take a break during the holidays! Yumm!! It looks so chocolatey & fudgy delicious! Love itt! Oh, Lara! Yes! 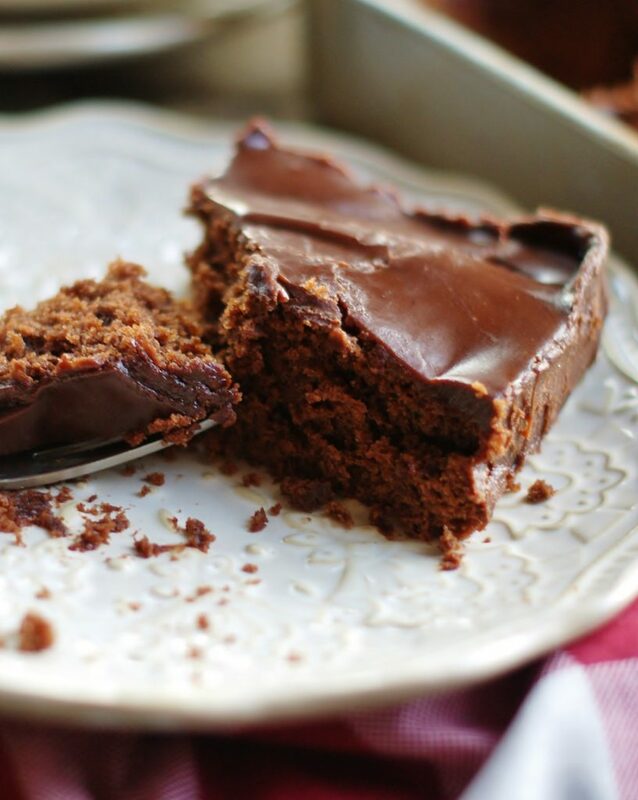 If fudgey and chocolatey is your thing, then this is your cake! Luis, let me know how it turns out. We just love this cake around here! 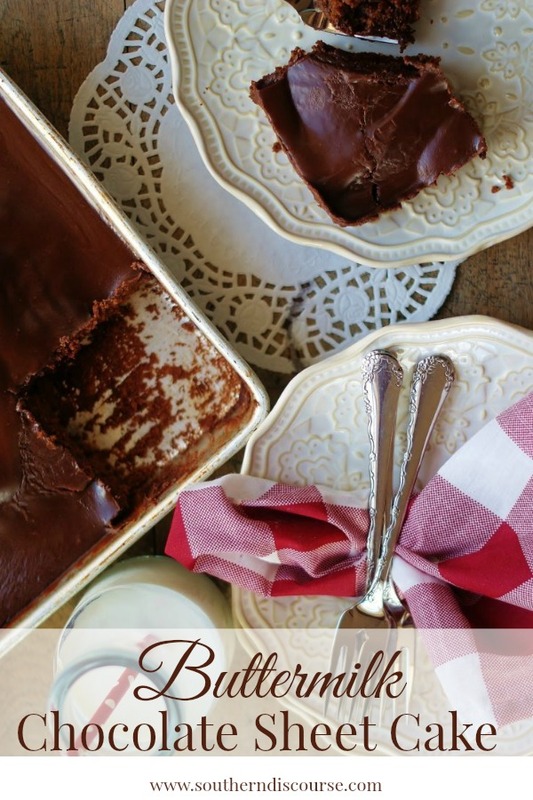 Your Chocolate Buttermilk Sheet Cake looks fabulous and I can’t wait to try the recipe! 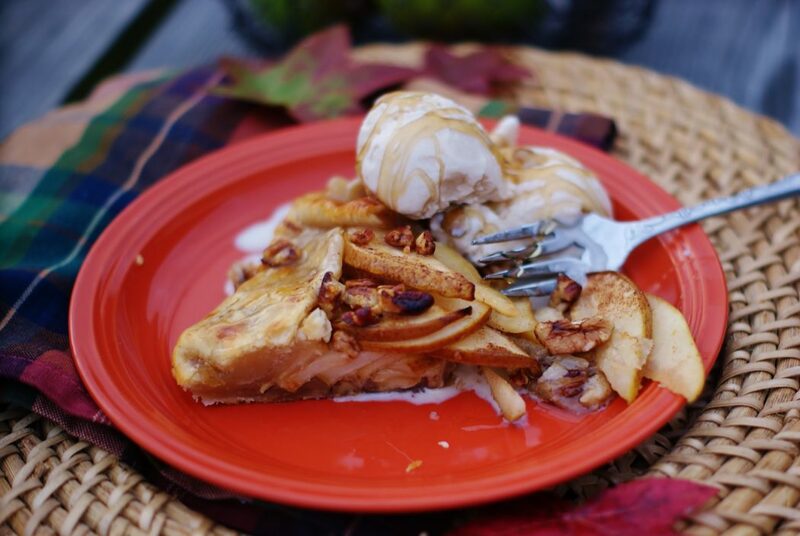 Thanks so much for sharing your post with us at Full Plate Thursday! Have a great week and come back to see us real soon! 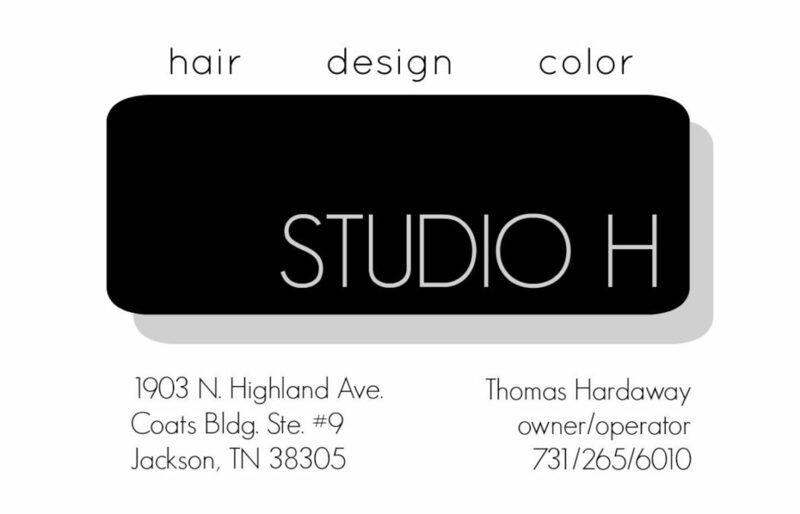 Thanks, Miz Helen! 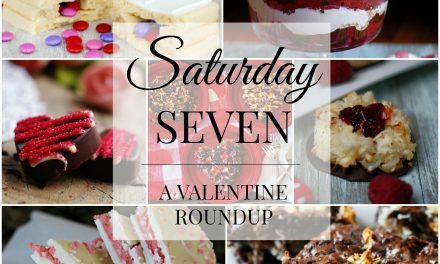 I was so glad to link up and had a great time visiting all of the other fabulous recipes that were linked up too. Thank you so much for being such a wonderful hostess! Oh WOW! I am doing the happy dance right now! That is just awesome! Thank you so much for hosting Full Plate Thursday!! 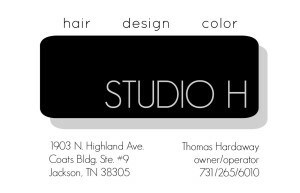 It is such a wonderful place find delicious homestyle recipes. 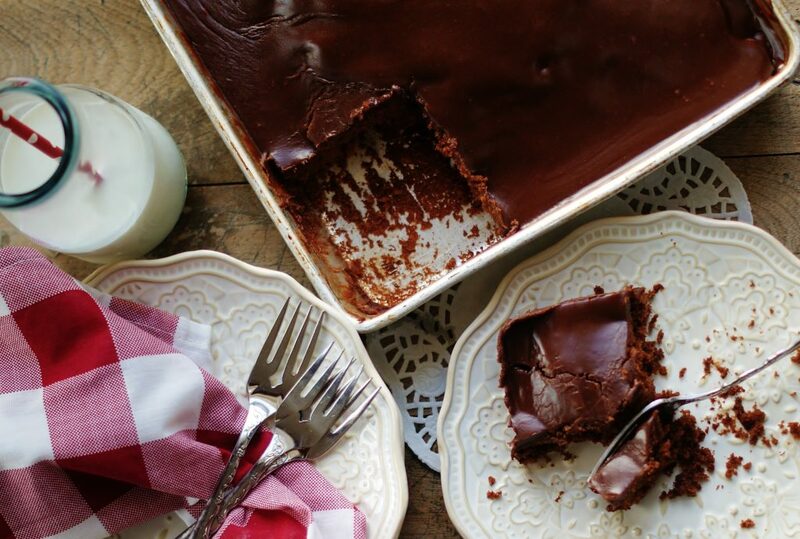 Oh, how I love chocolate buttermilk sheet cake. This looks absolutely wonderful!! 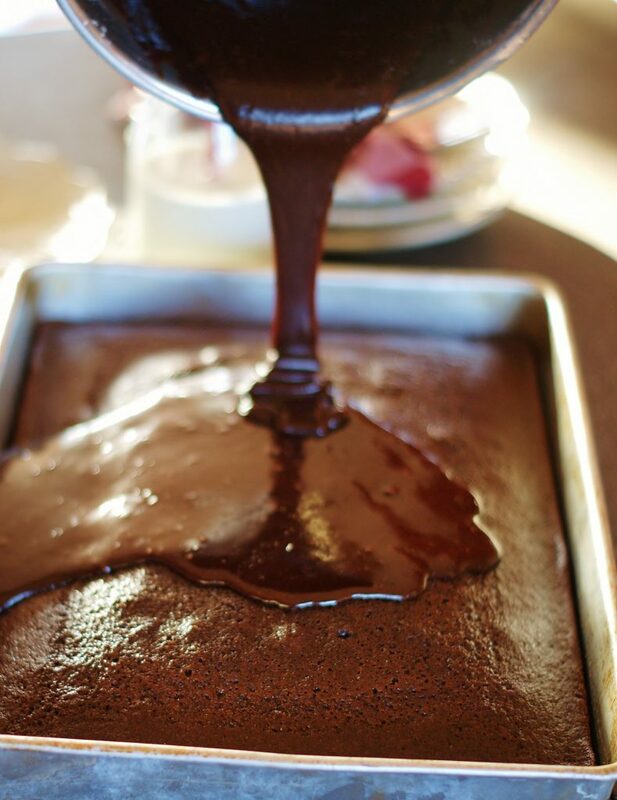 Your Chocolate Buttermilk Sheet Cake is pure comfort, I will love it! Hope you are having a great week and thank you so much for sharing with us at Full Plate Thursday!